As long shadows fall on a beautiful sun-lit evening in Sauternes, it is easy to appreciate that not all sweet wine is created equal. 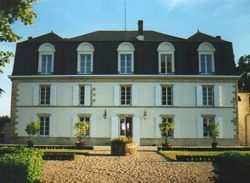 The elegant Château Guiraud has thrown open its doors to welcome a gaggle of winemakers from all over France, who pour glasses of golden liquid for a chattering, good-natured throng. This seems much more like an extended-family gathering than the serious business of preserving the ultimate quality in sweet French wines.It is in fact the launch of a brand new association of French winemakers called Sapros”, who’s membership is drawn from small pockets of fanaticism all over the country. The name Sapros gives the clue: it is from the Greek, meaning “rotten, putrid, spoiled”. An inauspicious choice you might think, but Sapros is an association that celebrates Botrytis cinerea, the “Noble Rot”. Much cheap sweet wine is simply sweetened-up by adding unfermented grape juice, but the best wines are made in the vineyard not the winery, and are much less predictable. Each vintage is at the mercy of nature’s vagaries, especially for those who await the right combination of sun, wind and mist to create conditions for Botrytis, the rot that will magically concentrate their grapes. President of Sapros is Jean Thévenet of Domaine de la Bongran, a fascinating estate in Burgundy’s Mâconnais. Thévenet makes wine from chardonnay grapes at three levels of increasing richness and sweetness, the top cuveé is 100 percent Botrytised. Thévenet is a driven winemaker and Maverick, who battles with the strictures of the Appellation Controlée system that deny his brilliant wines a higher designation than basic Mâcon-Villages, simply because they are outside the norm.Thévenet is a natural first president for Sapros; a clearly passionate winemaker who will not compromise. That attitude sums up an association who’s motto is “Escorting Mother Nature”; by implication accepting the inherent hazards of their chosen winemaking path, and rejecting “artificial” practices that are common in making sweet wines. Top target for Sapros is Chaptalisation: they reject this practice which does not rely totally on Botrytis cinerea, the “noble rot”, to enrich the fermenting must, but also on added sugar. Though illegal for Botrytised wines in Alsace, as it is for Germany’s great Beerenaulsesen and Trockenbeerenauslesen wines, it is both legal and commonplace in other sweet wine appellations of France. The sugar will boost the final alcohol (as sugar is converted to alcohol during fermentation) and will enrich the finished wine.Crucially, the practice will also guarantee that more wine is made: Botrytised grapes give up dramatically reduced volumes of juice when pressed, so a judicious sack or two of sugar can artificially enrich less noble juice and eke out production. It is a surprising fact that of all the Châteaux of Sauternes for example, only four declare that they do not Chaptalise. Sapros also rejects other forms of intervention and technological winemaking, like the use of laboratory yeasts, machines to concentrate the must by removing water content, and “cryo-extractors” – machines that artificially replicate the ice-forming process that makes ice-wine. This has a fine egg-custard nose with plenty of figgy richness, nuts and full peach and apricot fruit. The palate is mellow and fully sweet, with luscious texture and fine mineral acidity into a long finish. Philippe Delesvaux is pictured, right. Gorgeously sweet apple and pear nose, layered with quince, citrus and acaicia honey. The palate is super-sweet with marzipan overtones to luscious, searingly ripe fruit that is long and pure into a finish sharpened by good acidity. Les Lys is made only in exceptional years: there was none between 1990 and 1996. It is fresh and bright with gentle apricot fruit and a beautifully delineated sweet palate of nectarines and musky, exotic richness. Long and lush, but beautifully balanced. This is the middle of Thévenets three-tier range, mostly from late-harvest grapes. It has an unusual nose of honeyed peach skins and custard apples. The palate is gripped by powerful acidity, with notes of orange and grapefruit. Opulent nose of vanilla, peach, pineapple and coconut with just a hint of tea and honey. Full-bodied and very luscious, with peach syrup and nectarine fruit and a core of mineral acidity to lengthen the finish. Light, fragrant pear fruit on the nose; floral and pure. Clean, fresh palate has a good weight of fruit. Mandarin orange and ripe peach, and a hint of exotic spice. Medium-bodied and very long. Beautifully honeyed orange fruit, candied and rich and very aromatic. There’s a steely edge on the palate to racy orange and sweet plum fruit, full and spicy with good length. Smoky nose with lots of schisty quality and fine orange fruit. Honeyed and rich with syrupy, sweet fruit on the palate, hints of fig and brioche and lovely wieght into a tantalising, long finish. Sapros have their own Web site at www.sapros.org.